Last week I had the pleasure of delivering a Keynote at the 4th Digital Earth Summit in Wellington, New Zealand. This was a wonderful experience in a number of ways, firstly Wellington really is the coolest little capital on the planet, secondly as always I meet a great bunch of people including some budding entrepreneurs and opengov competition winners in the form of Friendsafe. 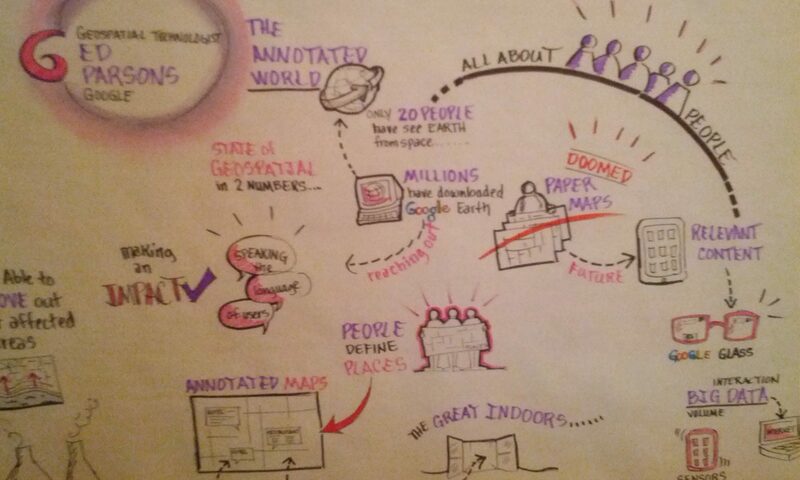 What was really special however was that each keynote presentation was visualised by Pamela from Drawing on Ideas , this is the visualisation of my presentation on the annotated world. As a presenter is really valuable to see your ideas played back in this way.. I hope that my message finds you well . We work for Saffronart, India’s largest auction house. We have currently launched The Story by Saffronart which brings together curated collections of hard-to-find, beautiful and significant objects. Essentially the idea behind this is that now one doesn’t have to wait for an auction to acquire these objects as they will be available for immediate sale every day. The collections include art, jewelry, maps, early-edition books, unique home accessories, rare watches & pens, unusual designed objects and memorabilia. I’m not sure how you plan your content, but I thought you might be interested in a collection of magnificent old and rare maps we have on sale. Some of them include maps of India from (1525-1619), The German cartographer Sebastian Munster (1488-1552), A Venetian cartographer Jacobo Gastaldi (1500-1566) etc. Do have a look at our website http://www.saffronart.com and let me know if this is of any interest to you.